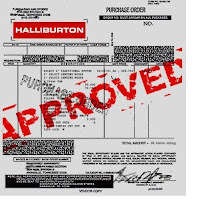 Mullin's World: War Profiteering; Military Contractors rip off America and the troops. War Profiteering; Military Contractors rip off America and the troops. There's a $400 million question facing the Pentagon's largest contractor, KBR, the former Halliburton subsidiary responsible for more than 50,000 personnel in Iraq and billions in government contracts: Will the mammoth corporation be forced to repay the government nearly half a billion dollars because it hired private security forces in Iraq, including Blackwater USA, when the Army itself was supposed to be providing it with protection? The Great Iraq Swindle; How Bush Allowed an Army of For-Profit Contractors to Invade the U.S. Treasury. This was reported back in September 2007, and nothing has changed. 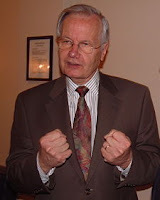 "The only thing they (conservative right) loathe more than liberals is the truth and the quickest way to be damned by them is to tell the truth...They want your reporting to validate their belief system"
On May 15th 2005 in St. Louis Missouri at the National Conference on Media Reform, Bill Moyers address the issue of freedom of the media and the pressure from the right against anything resembling free speech. It is worth revisiting in light of the current attacks by the right and right wing media that has tried to silence any dissent from their agenda. SPECIAL REPORT! Obama responsible for ills that beset America. It seems that the republican right and John McCain have decided that Obama is responsible for the rise in oil prices. Don't stop there he is probably responsible for the housing meltdown that has by some estimates up to 6 million Americans over the next few years losing their homes. He has to be responsible for the increase in violence in Afghanistan, inflation, declining dollar, the dangerous imports coming in from China, the failure of the EPA to protect Americans, the failure to respond to the poor in Louisiana after Katrina. The list can go on how about global warming, torture of prisoners in Guantanamo, etc. It is not surprising that the right hates Obama; he is responsible for the all ills that affect America. THE DARK SIDE is a dramatic, riveting, and definitive narrative account of how the United States made terrible decisions in the pursuit of terrorists around the world-- decisions that not only violated the Constitution to which White House officials took an oath to uphold, but also hampered the pursuit of Al Qaeda. In gripping detail, acclaimed New Yorker writer and bestselling author, Jane Mayer, relates the impact of these decisions—U.S.-held prisoners, some of them completely innocent, were subjected to treatment more reminiscent of the Spanish Inquisition than the twenty-first century. THE DARK SIDE will chronicle real, specific cases, shown in real time against the larger tableau of what was happening in Washington, looking at the intelligence gained—or not—and the price paid. In some instances, torture worked. In many more, it led to false information, sometimes with devastating results. For instance, there is the stunning admission of one of the detainees, Sheikh Ibn al-Libi, that the confession he gave under duress—which provided a key piece of evidence buttressing congressional support of going to war against Iraq--was in fact fabricated, to make the torture stop. Of the nearly two dozen books published so far that describe and document the nefarious deeds of George Bush's administration, Jane Mayer's book, "The Dark Side" , is perhaps the most thoroughly researched, meticulous, impressive, and deeply disturbing. It is also gripping and highly readable. I am convinced that what Woodward and Bernstein's book "All the President's Men" did to the Nixon administration, Jane Mayer's book "The Dark Side" will do to George Bush's administration: blow away, like a piece of straw, the last sliver of credibility that the few remaining supporters of George Bush desperately cling to. "We don't torture", said the President, and Jane Mayer has responded with this book, as if to say: "That is a lie". Al Gore America and Energy. Al Gore speech to America, what can be done. Gore Pushes for Sweeping Changes to Energy Policy. Also a ABC one and one interview. On July 13 an outpost in Wanat, Afghanistan was attacked by small-arms fire and rocket propelled grenades by enemy forces numbering about 200, nine Americans died that day. In a war largely forgotten by the American public these young American soldiers gave the ultimate sacrifice for their country. Army Pfc. Sergio S. Abad, 21, of Morganfield, Ky.; assigned to the 2nd Battalion, 503d Infantry Regiment (Airborne), 173rd Airborne Brigade Combat Team, Vicenza, Italy; died of wounds sustained when his outpost was attacked by small-arms fire and rocket propelled grenades from enemy forces in Wanat, Afghanistan, on July 13. Also killed were 1st Lt. Jonathan P. Brostrom, Sgt. Israel Garcia, Cpl. Jonathan R. Ayers, Cpl. Jason D. Hovater, Cpl. Jason M. Bogar, Cpl. Matthew B. Phillips, Cpl. Pruitt A. Rainey and Cpl. Gunnar W. Zwilling. Army Cpl. Jonathan R. Ayers, 24, of Snellville, Ga.; assigned to the 2nd Battalion, 503d Infantry Regiment (Airborne), 173rd Airborne Brigade Combat Team, Vicenza, Italy; died of wounds sustained when his outpost was attacked by small-arms fire and rocket propelled grenades from enemy forces in Wanat, Afghanistan, on July 13. Also killed were 1st Lt. Jonathan P. Brostrom, Sgt. Israel Garcia, Cpl. Jason M. Bogar, Cpl. Jason D. Hovater, Cpl. Matthew B. Phillips, Cpl. Pruitt A. Rainey, Cpl. Gunnar W. Zwilling and Pfc. Sergio S. Abad. Army Cpl. Jason M. Bogar, 25, of Seattle; assigned to the 2nd Battalion, 503rd Infantry Regiment (Airborne), 173rd Airborne Brigade Combat Team, Vicenza, Italy; died of wounds sustained when his outpost was attacked by small-arms fire and rocket propelled grenades from enemy forces in Wanat, Afghanistan, on July 13. Also killed were 1st Lt. Jonathan P. Brostrom, Sgt. Israel Garcia, Cpl. Jonathan R. Ayers, Cpl. Jason D. Hovater, Cpl. Matthew B. Phillips, Cpl. Pruitt A. Rainey, Cpl. Gunnar W. Zwilling and Pfc. Sergio S. Abad. Army Sgt. Israel Garcia, 24, of Long Beach, Calif.; assigned to the 2nd Battalion, 503d Infantry Regiment (Airborne), 173rd Airborne Brigade Combat Team, Vicenza, Italy; died of wounds sustained when his outpost was attacked by small-arms fire and rocket propelled grenades from enemy forces in Wanat, Afghanistan, on July 13. Also killed were 1st Lt. Jonathan P. Brostrom, Cpl. Jonathan R. Ayers, Cpl. Jason M. Bogar, Cpl. Jason D. Hovater, Cpl. Matthew B. Phillips, Cpl. Pruitt A. Rainey, Cpl. Gunnar W. Zwilling and Pfc. Sergio S. Abad. Army 1st Lt. Jonathan P. Brostrom, 24, of Hawaii; assigned to the 2nd Battalion, 503d Infantry Regiment (Airborne), 173rd Airborne Brigade Combat Team, Vicenza, Italy; died of wounds sustained when his outpost was attacked by small-arms fire and rocket propelled grenades from enemy forces in Wanat, Afghanistan, on July 13. Also killed were Sgt. Israel Garcia, Cpl. Jonathan R. Ayers, Cpl. Jason M. Bogar, Cpl. Jason D. Hovater, Cpl. Matthew B. Phillips, Cpl. Pruitt A. Rainey, Cpl. Gunnar W. Zwilling and Pfc. Sergio S. Abad. Army Cpl. Gunnar W. Zwilling, 20, of Florissant, Mo. ; assigned to the 2nd Battalion, 503d Infantry Regiment (Airborne), 173rd Airborne Brigade Combat Team, Vicenza, Italy; died of wounds sustained when his outpost was attacked by small-arms fire and rocket propelled grenades from enemy forces in Wanat, Afghanistan, on July 13. Also killed were 1st Lt. Jonathan P. Brostrom, Sgt. Israel Garcia, Cpl. Jonathan R. Ayers, Cpl. Jason D. Hovater, Cpl. Jason M. Bogar, Cpl. Matthew B. Phillips, Cpl. Pruitt A. Rainey and Pfc. Sergio S. Abad. Army Cpl. Pruitt A. Rainey, 22, of Haw River, N.C.; assigned to the 2nd Battalion, 503d Infantry Regiment (Airborne), 173rd Airborne Brigade Combat Team, Vicenza, Italy; died of wounds sustained when his outpost was attacked by small-arms fire and rocket propelled grenades from enemy forces in Wanat, Afghanistan, on July 13. Also killed were 1st Lt. Jonathan P. Brostrom, Sgt. Israel Garcia, Cpl. Jonathan R. Ayers, Cpl. Jason D. Hovater, Cpl. Jason M. Bogar, Cpl. Matthew B. Phillips, Cpl. Gunnar W. Zwilling and Pfc. Sergio S. Abad. Army Cpl. Matthew B. Phillips, 27, of Jasper, Ga.; assigned to the 2nd Battalion, 503d Infantry Regiment (Airborne), 173rd Airborne Brigade Combat Team, Vicenza, Italy; died of wounds sustained when his outpost was attacked by small-arms fire and rocket propelled grenades from enemy forces in Wanat, Afghanistan, on July 13. Also killed were 1st Lt. Jonathan P. Brostrom, Sgt. Israel Garcia, Cpl. Jonathan R. Ayers, Cpl. Jason D. Hovater, Cpl. Jason M. Bogar, Cpl. Pruitt A. Rainey, Cpl. Gunnar W. Zwilling and Pfc. Sergio S. Abad. Army Cpl. Jason D. Hovater, 24, of Clinton, Tenn.; assigned to the 2nd Battalion, 503d Infantry Regiment (Airborne), 173rd Airborne Brigade Combat Team, Vicenza, Italy; died of wounds sustained when his outpost was attacked by small-arms fire and rocket propelled grenades from enemy forces in Wanat, Afghanistan, on July 13. Also killed were 1st Lt. Jonathan P. Brostrom, Sgt. Israel Garcia, Cpl. Jonathan R. Ayers, Cpl. Jason M. Bogar, Cpl. Matthew B. Phillips, Cpl. Pruitt A. Rainey, Cpl. Gunnar W. Zwilling and Pfc. Sergio S. Abad.